As far as assessing one’s annual power requirement or annual energy output is concerned, this may be achieved by using the following formula. Note: The difference between power and energy is that power is measured in kw which is the rate at which electricity is consumed while energy is described at kwh, which is the quantity consumed. Assessing wind speed in a given area may be obtained through the help of an Anemometer, but measurements often go haywire if the terrain is hilly or where wind comes from different directions. In fact, it is read from a graph where electrical power output is plotted against the wind speed to reach at the required figure. However, average wind speed at any particular site (within the <?xml:namespace prefix = st1 ns = "urn:schemas-microsoft-com:office:smarttags" />United States) can be obtained from WindPower America but Power Curves, also required in assessing power requirement are difficult to create. Nevertheless, once these are reasonably obtained, you need to pay attention towards building the wind power generator that is technically termed the ‘wind turbine’. Building a wind turbine involves several items that include (a) a small motor that can be turned into a generator; (b) blades to turn the motor; (c) a converter to convert the DC voltage obtained through the wind power generator into usable 120V AC current; (d) an electronic control system to switch the generated current from the batteries in order to save their lives (over-charging often spoils the batteries) to a dummy load. Alternatively, it also turns any surplus current to the grid in which case the utility pays for the power directed to them. A tower is finally required to set the generator high up in the air for the operation to start functioning. As for the motor, it is mostly available at the local hardware store. The blades for the motor/generator are also not so difficult to procure. They can either be curved out of wood or sliced out of 6” ABS pipe 24” long. These blades (3 in number) are next bolted onto a hub for which another trip to the hardware store is needed. The hub along with the blades is then bolted to the generator’s spindle so that it may rotate freely at the first touch of a gust of wind. A charge controller is then needed to monitor the power obtained from the generator while a tower is made ready to set the generator at a considerable height to receive the force of wind. A 10 feet long conduit will serve the purpose fairly well. In view of the harmful effects associated with fossil fuel generated power, it should now be the aim of every right thinking American to look for alternative sources of which the wind is of paramount value. First of all, it is available free of cost and is a renewable form of energy. It does not pollute the air nor does it increase the greenhouse effect and is almost maintenance free. 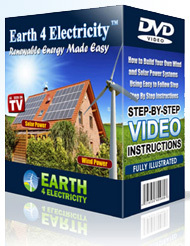 And secondly, just build your own wind power system and you will see a dramatic reduction in your power bills as well. So are you interested? All you need to know before opting for electric wind power is where to buy cheap parts from, know about the safety precautions, learn how to choose the best location and also know to wire the system.